Can he juggle everything…including her? After raising his siblings and running the family pub for more than a decade, Aiden Walsh has set his own dreams aside. Until the most beautiful woman he’s ever seen stumbles into his bar, and his arms. Too bad Rebecca Day is the school psychologist in charge of his brother’s future. Who’s he kidding? He doesn’t have room in his full life for romance anyway. 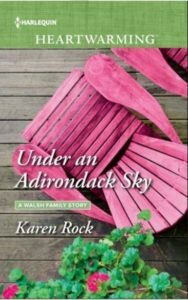 But forced to join Rebecca and her group of troubled teens on an Adirondack retreat, he realizes keeping his family afloat isn’t enough for him…not by a long shot. Award-winning author Karen Rock is both sweet and spicy–at least when it comes to her writing! The author of both YA and adult contemporary books writes red-hot novels for Harlequin Blaze and small-town romances for Harlequin Heartwarming. A strong believer in Happily-Ever-After, Karen loves creating unforgettable stories that leave her readers with a smile. When she’s not writing, Karen is an avid reader who’s typically immersed in three different books at a time, all in different genres. She also loves cooking her grandmother’s Italian recipes, baking, Christmas (no need to specify–she loves every bit of it), and having the Adirondack Park wilderness as her backyard, where she lives with her husband, daughter, dog and cat who keep her life interesting and complete. I don’t read a lot of romance novels. I read a decent amount of contemporary fiction, some of which has romance in it, but typically, I don’t read ‘traditional’ romance novels. However, when it’s high summer, the temperature is over a hundred, and the humidity is so intense it makes me wish I had gills, there’s nothing so relaxing as devouring a Harlequin novel, and the most recent such book to help me feel calm and cool was Karen Rock’s Under an Adirondack Sky. The formula is fairly de rigueur: Rebecca Day is a school psychologist up for tenure. Aidan Walsh owns a bar and takes care of his younger brothers and sisters because his father is dead and his mother has early-onset Alzheimers. With Connor, Aidan’s teenaged brother and Rebecca’s patient, as the catalyst the pair become first adversaries, then allies, and finally fall in love. That much, you can glean from the back cover. But what the cover doesn’t tell you is that author Karen Rock has given us a story that is fresh, fun, and doesn’t feel at all formulaic when you’re reading it. Sure, there’s a little bit of contrivance in getting Rebecca, some of her colleagues, a few parents and the most challenging students out to an Adirondack farmhouse for a couple of weeks of tech-free living and personal encounters, but really, it’s no more contrived than when Agatha Christie throws a dinner party so Miss Marple can solve a crime. Besides, the time at the farmhouse makes you want to step into the novel and hang out with everyone, fishing and grilling food on the porch and learning to knit, and being nurtured by the homeowners as well as the mental health professionals. Rebecca is a lovely character, sunny and bright much of the time, but no Pollyanna, and her pleasant manner hides depth that we do get to peek at. Aidan is much more interesting than the typical “twinkling brown eyes” romantic hero, and is also surprisingly complex. Connor, around whom the story revolves, is well-drawn, as are the rest of his peers. In fact the whole novel is a good look at the way young teens process emotional distress, and at the way communication is a key element of all relationships, not just the romantic ones. 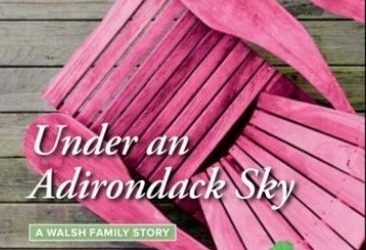 Curl up with a glass of ice tea and a healthy amount of sunscreen, and spend and afternoon reading Under and Adirondack Sky; it will leave you smiling. Goes well with fresh-caught fish, grilled on a back-yard BBQ, homegrown vegetables, and jacket potatoes.